ATK had won the first leg encounter between the two teams 3-2 on December 10 and will now meet the winners of the second semi-final between Kerala Blasters and Delhi Dynamos in the summit clash at Kochi on December 18. Atletico de Kolkata, reduced to ten men from the 43d minute, reached the final of the Indian Super League on goal aggregate after playing out a hard-tackling, goalless draw with Mumbai City FC in the second leg semi-final at the Mumbai Football Arena on Wednesday. There was an ugly free for all after the final whistle with the rival players and the support staff getting into a scuffle near the touch line. Mumbai City needed to over-turn a one goal deficit but could not do so in spite of dominating the first half and then failed to find the mark even in the second half which was played by ATK with only ten men on the field. 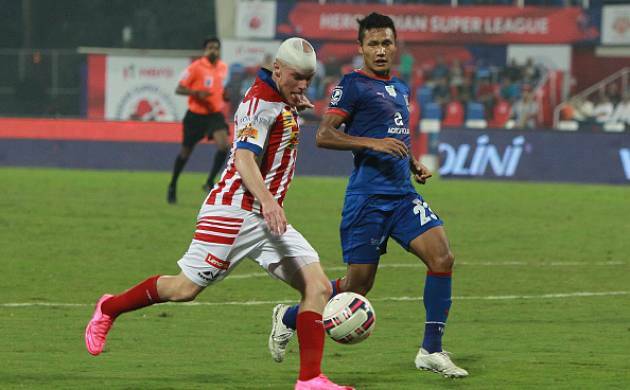 Mumbai gave the captaincy honours to star India striker Sunil Chhetri in the absence of their marquee player Diego Forlan who was suspended after picking up two yellows in the first leg held in ATK’s home venue, but the star forward was found wanting in the crucial game. The Uruguayan stalwart was also sorely missed by the hosts at a venue where he had secured a superb hat-trick in the round robin stage. Mumbai had the better share of the exchanges in the opening half and also the best chance to score, perhaps in the entire match, in the seventh minute of the game. But Chhetri muffed in a one-on-one situation with rival goalkeeper Debjit Majumder, who brought off a fine save by charging out and covering the angle. The pass provider was Romanian Lucian Goian, with a brilliant punt down the middle that put the Indian striker free to score. ATK suffered a major blow late in the half when midfielder Robert Lalthlamuana was sent off in the 43rd minute following a double-booking, reducing the former champions down to ten men. ATK also made forays into the rival area but their first real chance came when Javier Lara sent Abinash Ruidas up on a run down the left flank for the latter to square the ball to substitute Lalrindika Ralte who took the shot on the bounce which was blocked before it could spell danger to the Mumbai goal at the top of the box by the home team’s L Ralte. Just prior to this attempt, ATK got the first of four yellow cards in this half when their Spanish captain Borja Fernandez fouled Brazilian Gerson Vieira. Winger Ruidas gave a fine square pass into the box that went waste as Juan Belencoso was found wanting. All these frustrations turned into ill-temper and the result was Lalthlamuana’s double booking in the 34th and 43rd minutes leading to his ejection from the field.